My shiny new MacBook Pro arrived! After four years, it was time for an upgrade. Much of the work I do on the computer is photo processing. I use Aperture, which I really love, but it can be quite demanding and the processor speed, graphics card and RAM in my old machine just weren’t cutting it. Thunderstorms and time constraints delayed my getting to the new laptop for about 24 hours. It took about an hour to migrate my old machine over to the new one. I was immediately impressed by the increased speed. Everything happens faster–windows load quicker, applications launch immediately and making edits to photos blissfully happens without any appearance of the dreaded spinning beach balls. I opted for the glossy screen this time around. (My previous MacBook had the matte screen, since I was concerned about glare and image quality.) After spending a year with the iPad’s amazingly brilliant screen, I knew that I really wanted to have the same eye-popping experience on the laptop. I’m very happy with my choice. Any fear of glare was immediately put to rest (there is none) and everything looks amazing. I’m disappointed to say that I’m still experiencing the occasional spinning beach ball, which surprises the heck out of me. Everything about this machine is wicked-fast, but there are times when the beach ball appears while I’m using the internet. Since my machine came with the new Lion OS, the problem could be that, the new machine, my internet connection–or a combination of all three. The jury is still out but it certainly is baffling. Other than that minor quibble, just as expected, I’m loving my new MacBook Pro. Shopping at the Apple store. And this time I mean business. I’ve got a MobileMe account that I’m trying out for free, but there’s no way to give photo galleries or videos any sort of description beyond a title and there’s no ability for visitors to leave comments. Not great. Plus, I wasn’t crazy about the viewing size and quality constraints, so it’s not really an option. I signed up for a Vimeo account two years ago and I’m only now getting around to exploring it. It was a snap to use (though uploading can take some time, so I set it for overnight and left it.) Other than the occasional stuttering of playback, which I think has more to do with my internet/wireless combo, I’m pleased with the way it looks. I edited this snippet in 2008 as an exercise to get acquainted with iMovie; I used footage of Niagara Falls that I’d shot with my then very new G9. In fact, I’d been shooting photos of the falls for twenty minutes when I suddenly remembered I had the capacity to shoot video at all. Over the Edge from 2Things@Once on Vimeo. Click here see a higher res version, without the black bars. As I type this, One & Other, the 2400-hour-long art project atop Trafalgar Square’s fourth plinth, is just four hours from the finish line. What began back on July 6th at 9am, ends on October 14th at 9am. I spent many an hour during this past “summer of the plinth” fascinated, amused, entertained, and educated by what participants brought to their hour on the plinth. This past month, I didn’t have much time to plinth. Perhaps I’ll dip into the archives on the website from time to time. I hear they’ll be available through the end of the year. Plinth plinth plinth plinth plinth. It’s a great word. I’ll miss using it with such regularity. Cheerio plinth. It’s been fun. So, I’m coming up on three weeks with the newest member of the family and I thought it would be fun to pass along my first impressions of life with the iPhone. I’m happy to report that after such great expectations, the iPhone has not disappointed in any way, save for the handful of dropped calls I’ve experienced. We know who’s to blame for that and it ain’t the Apple. Already, I’ve had more dropped calls in my first ten days of AT&T service then I did in all my ten (was it??) years of Sprint service. But that was to be expected. Usability: So far, I’ve found the iPhone easy to use, and while not 100% intuitive, the answers are always easy to find on the internet. I like the finger flick on the screen to scroll or page through content. Fast. And the on-screen keyboard is just fine by me, but all I have to compare it to is using the keypad to type in text, so this is a big step up. And as soon as I get used to the fact that the delete key is not the return key, I’ll be a whiz. I love the auto-complete and is it just me, or does it seem to get smarter the more I use it? The Screen: A big beautiful color screen for web surfing and everything else under the sun. Email: I’m using my Gmail account on the phone rather than Mac mail and it’s such a pleasure now to be able to return email when I’m away from my computer. The only thing I miss is the ability to star/flag an email (on the phone the only option is to mark it unread.) A minor gripe. Voice Memo: I’ve already mentioned how this one came in handy while birding. I can see voice memo getting a lot of creative use in the future. Camera: The image quality is a huge step up from what I had before and I love it. I’m still getting the hang of touching the screen to focus but that will come with use. I’m looking forward to playing around with it more and getting creative. I’ve spent only a minute or two messing with the video, so lots to try there. Having the ability to snap a photo on the fly and email it to friends or carry it around for reference is terrific. For example, I had to pick up a drawer organizer at the Container Store. Rather than try to remember what all I was trying to contain, I snapped a photo and stood with it in the store trying to figure out the best option. Brilliant. Image Capture: Using this simple program on my Mac, I can easily download photos from my phone to save and manipulate on my laptop. Way way way easier than before. Silencing the phone: Is now as easy as flicking a tab on the side of the phone. With my old phone, this simple task touch three menus and five key punches to achieve. Spotlight Search: Having the ability to globally search the phone is terrific. I needed to gather all the dates and info for this year’s Lyric Opera season. A quick search for Lyric pulled up all the necessary dates in two seconds. Compass: Came in handy a few days after I got the phone and had to drive Maisy out to the imaging center in Buffalo Grove. I started to GoogleMap the location on my laptop and then remembered, I could take the map with me! In real time it followed me along the route and gave me traffic info along the way. Notes: A great way for me to jot down quick information or my thoughts. The items for this blog post started as a note page on my iPhone, collected on the fly. Also handy for notes about books I’m reading. I like that there’s also the ability to email a note. Alarm: This one is taking the most for me to get used to. I’ve used my cell phone as my alarm clock for years and for some reason, this interface is taking a bit of getting used to. Also, I’ve learned there are certain ring tones I will sleep right through. The one drawback with using the iPhone as an alarm is that when a message or a calendar alert comes through (ba-ding) it will wake you up! iPod: Now I have the ability to click on a song that’s playing and access the entire album it came from. This is something I’ve long wished my old iPod could do. Genius Mixes (a new iTunes feature that creates a kind of genre-specific personalized music stream from your own music) are a great way to dig deep into my music library. The Size: Here’s the only feature where my previous, compact flip phone had an edge over the iPhone. With the size and heft of a thin brick (albeit an awesomely powerful and cool brick) the iPhone just doesn’t easily pop in the pocket. But I’ll just have to suffer. Tomorrow, more about the apps I’m using. For the past two weeks, my iPhone has been a near constant source of “oh wows” as I discover all the cool things it (and I) can do. And now, in the span of these two weeks, two of my major complaints about the phone seem to have been eliminated. The first concerned TypePad’s blogging app, which I used on a friend’s phone this past April to post photos while on vacation in the BVIs. Only when I returned, did I make the unfortunate discovery that the app cropped the photos square. Yuck. Then comes the announcement today that AT&T will (finally) allow MMS on iPhone 3G and 3GS beginning Friday. This is excellent news, since the lack of ability to directly send photos between phones was the only real drawback I saw in getting an iPhone (other than the notoriously crappy AT&T service, of course.) Even with my grainy old camera phone, I shot a lot of photos and frequently sent them to friends, including JD’s mom, who enjoyed getting fun snaps of her gal while at at work. Photo by FrankLong on Flickr. GeraldC — Godzilla destroys London. Bushewacker — Made a 360-degree drawing of Trafalgar Square while standing inside a box with the clear plastic pallet all around him. Volorose — There have been a number of stationary cyclists on the plinth but this guy gave it an utterly unique spin with his Pee-Wee Herman bike and a thwarted if not noble attempt to use his own spinning to power his finale. MiniBeastGirl — A charming, dancing butterfly helps to raise awareness for cultivating urban wild spaces. Shells — Wearing a house dress and kerchief, she used her early morning spot to give the plinth a good scrubbing. Neil — Another stationary cyclist; this one donned a skeleton suit encircled by flags to raise awareness of bicycle deaths on London roadways. Allenby — Dressed as Buzz Lightyear and led a spirited aerobics work out for his hour. He was great fun and really had the crowd going. Lilacbonzai — The infamous first naked plinther who caused a controversy, not because he appeard “with his kit off” but because the cops told him to put it back on. 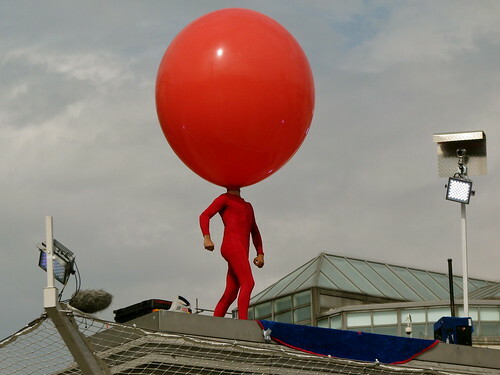 The Balloonatic — A veteran street performer plies his trade on the plinth, bouncing around on–and inside of–a giant red balloon. Chris_L — A touch of the absurd at the end of a fishing pole mixed in with infectious energetic solo dancing to his iPod. Bonus: I discovered a new group, The Wedding Present. Dial them up on MySpace and dance along. Less than two weeks to go and waiting is as hard as it gets. I swear if someone told me I could break my Sprint contract tomorrow for a quick $50, I’d probably do it. There have been about 25 times in the last week when I’ve thought, “Damn, if I just had an iPhone right now, I could do XYZ.” I know all my problems will magically disappear when I’ve got that sleek little computer in my possession. On the flip side, I’ve dropped my current phone at least as many times in the same time period. It’s probably my subconscious expressing my true feelings for the blasted thing but it’s making me wonder if I should look into an iPhone case made of bubble wrap. So, a couple of questions I’m throwing out to those of you who already own an iPhone–a question I’ve been asking everyone I know for the past few months–which iPhone app do you love best? Which one do you use the most? And finally, any advice as to whether or not I should go to the Apple store (my first choice) or ATT store to get the darned thing would be much appreciated. There are a lot of things I love about my local library but the computerized catalog system is definitely not one of them. It has, without a doubt, the absolute worst search function. Ever. Take this example for instance. I was looking for A Single Man by Christopher Isherwood, the next selection for my book club. I type the words single man in the search box and hit return. Scrolling down the entire page, the title I’m looking for AND TYPED IN EXACTLY, does not appear. Okay, I figure, knowing this is a hinky system that requires a lot more finesse than your usual computer search, I type in single man again, but this time rather than hitting return, I select the Title button. Frankly, this title list scares me. At home, I typed single man into Amazon’s search and, you guessed it, it pulled up the book I was looking for, number one on the results page.